It covers all types of wild game including big game, upland game, migratory waterfowl, fish and shellfish that are typically harvested in the Northwest. 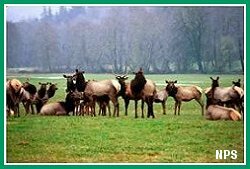 The site includes a brief history of wild game in the Northwest. The website also contains numerous excerpts from the Lewis and Clark Journals (1804 - 1806) which provides a perspective on subsistence living with total dependency on harvesting wild game.